The most commonly found fossil teeth are shark teeth although mammoth, mastodon, horse, bison, primate, and the teeth of skates, rays, whales and dolphins are also highly sought after. 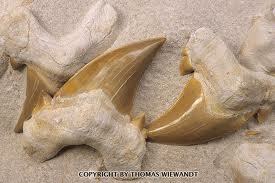 In general, the larger the tooth the more valuable although value is also based on whether the fossil teeth are rare. For example, mastodon teeth are smaller than mammoth teeth but are more valuable due to the rarity of the mastodon teeth. Fossil teeth found take many different forms. Many animals, including mammoths, sharks and reptiles go through quite a few sets of teeth during their lifetime, making it easier to find them. 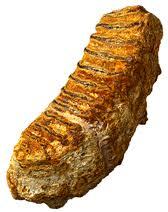 Mammoth teeth are often found after being tossed around by the ocean for many years, so their appearance may be rounded. 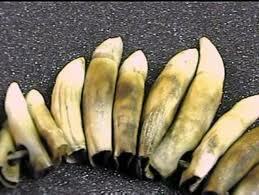 Mammoth teeth from the Pleistocene can be found in the North Sea, Alaska and Russia among other places. Mastodon teeth are most commonly found from the Shovel-Tusker Mastodon, since the teeth from the American Mastodon are much harder to find. Both the Shovel-Tusker Mastodon and the American Mastodon are a part of an extinct group of proboscidians with cusped molar teeth. The teeth of a shark are the only part of its body that is easy to fossilize because they are made up of bone while the rest of the shark is made up of cartilage. 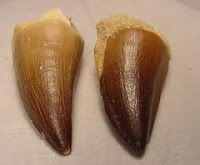 Small shark teeth are extremely common on some East Coast beaches but larger fossilized shark teeth are harder to find. 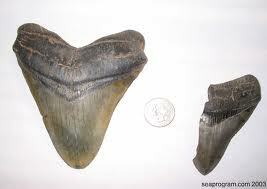 The Megalodon shark was over 40 feet long and is now extinct. 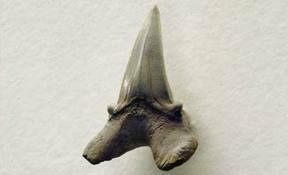 Fossil teeth from this shark are extremely valuable and are about 3 times as big as the teeth from a great white shark. Alligator teeth are commonly found in Florida. These fossil teeth are very important to the study of terrestrial vertebrates in North America. Many species of fossil whale teeth can be found in both North & South Carolina as well as several other locations around the world.